Data migration is a critical part of the implementation process when you invest in a new business management software solution. When your existing data is migrated to a new ERP system, there is a risk of importing inaccuracies, unknowns, and redundant material. Your legacy data needs to be scrubbed and mapped properly in Microsoft Excel to fit the new structure. Every company is different so the duration and complexity of the migration process depends on what data you are bringing over to the new system. Your legacy data includes Master Data, Opening Balances, and Transactional Data. Data migration decisions are made during the planning steps, where you start understanding your data and strategise what needs to be transferred over. Before you make a decision on what ERP solution is best for your company, you need to fully understand the product you are buying and choose the right partner to help guide you through implementation. With more than 70% of our customers moving from Sage 50 to SAP Business One, Vision33 has developed a set of best practises to guarantee quick time to value and a fast ROI for your company. 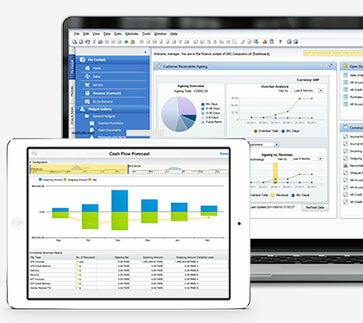 Vision33 starts by exporting only your Master Data and Opening Balances. Master Data includes customers, leads, suppliers, items, item prices and Chart of Accounts. Opening Balances includes your General Ledger, AR and AP invoices, purchase/sales orders, and period ending balances. The next step is to import that data into one of SAP Business One’s 300+ import templates to smooth the transition and simplify data cleansing. You don’t need to be a technical user to scrub your Master Data. This entire process should only take a couple of days and does not add significant time to the implementation process. With this method, you can make sure you are delivering accurate data that supports the needs of your business - mitigating the risk of delays, budget overruns, and scope reductions that can arise. Once you have the Master Data and Opening Balances in your new SAP Business One system, you can either leave Sage 50 available for historical querying or move on to importing Transactional Data, which includes General Ledger journal entries and invoice history. Based on the GL structure in SAP Business One, this option requires more effort because of the data cleansing. In most cases, it’s not necessary and pull comparison reports based on your Period Ending Balances without having to bring in the transactional history. If you would like to discuss any further details about the migration process and Vision33's implementation process, book a free consultation with one of our experienced Consultants. GDPR Legislation: Is Your Business Ready?